I had another awful night of sleep last night, and ended up wide awake an hour before my alarm was supposed to go off. So I dismissed the whole “pooh, another crap night of sleep” whine that was going through my head and headed to the gym early for a workout. After a 10-minute warm-up on the elliptical, I grabbed the 12.5 lb dumbbells and went through three rounds of the following exercises, decreasing reps with each cycle from 15-12-10. I didn’t think I was sweating a whole lot when I was doing it, but now that I’m sitting at my desk I am dying. I love that afterburn effect. 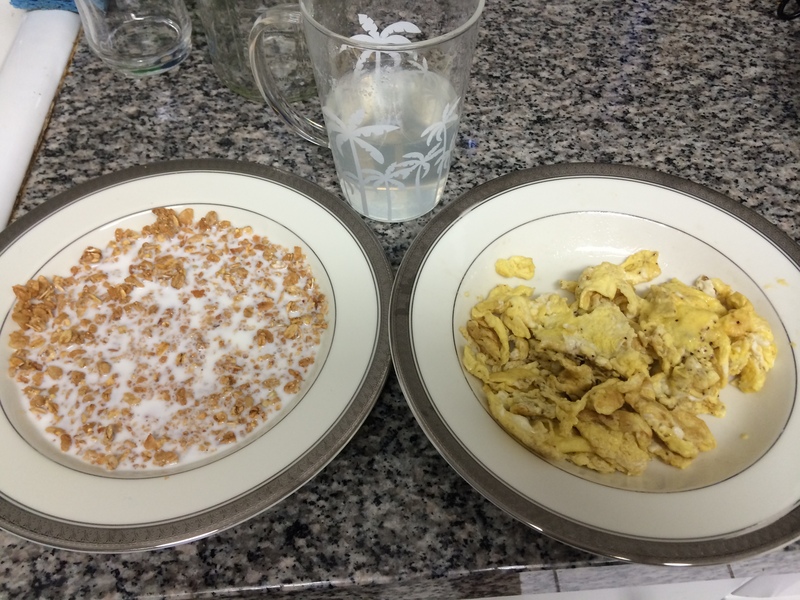 Breakfast was a quick egg scramble and the last of the KIND granola. I found the bag in the back of the pantry and figured I might as well finish it off before Monday’s Whole30 re-start. And some hot lemon water. I used to drink it every morning, but fell out of the habit. I hear it’s a good liver detox, so what the heck. Time to fire up the presses and get this day started. Woo hoo! Go make it a great day!